San Jose big rig crash. Two pickup trucks crashed on southbound Highway 101 in San Jose early Friday, spilling debris, which then punctured a big rig's gas tank. The vehicles involved were both white pickup trucks. One of them, which was carrying wood, flipped over near Bernal Road and the Highway 85 interchange. A Safeway truck passing the scene of the crash overturned upon hitting the wood pieces, which also ruptured its gas tank, causing nearly 50 gallons of fuel to spill on the side of the road. San Jose fire and Caltrans crews were on the scene of the hazmat incident, cleaning up. According to the California Highway Patrol, three left lanes were blocked, causing traffic to back up. 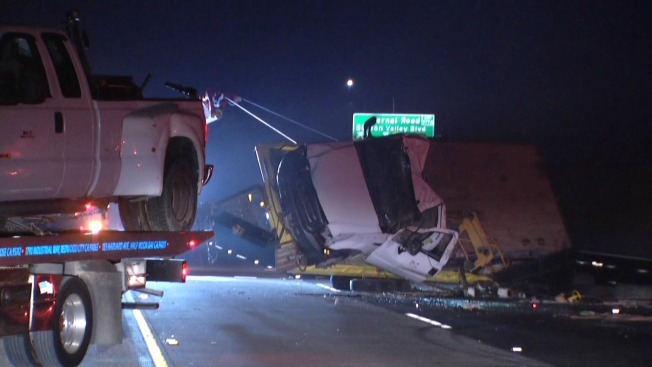 The lanes were reopened once the debris was cleared, but the CHP has warned of residual delays.